Paul Arnold is the founder of Switch Ventures and a volunteer at Defy Ventures. I was enjoying burgers with an economist friend who is interested in the world of venture. We were bouncing ideas around about where venture is heading, especially at the earliest stages, where I spend my time. His questions resonated with my inner econ nerd. And having thought about it since, I believe that the market for making seed investments remains quite attractive. This post explores that. Supply and demand set the rules here. The number of high-quality new startups determines the supply. The capital available for making seed investments determines the demand. The equilibrium where supply and demand intersect is, to simplify, the valuation (i.e. price) of typical seed rounds. Seed investors are the buyers in this market. As supply and demand both increase, the market becomes more healthy and robust. Where supply and demand meet, of course, is the market price — or in the case of venture, the valuation of an investment round. So where is this equilibrium settling out? This may surprise you: Valuations have been much more stable than many people realize. Although average seed valuations have increased over time, that doesn’t paint a useful picture. The reason is that the definition of “seed stage” has changed. Today’s seed investments are being made into much more mature and valuable companies than seed-stage investments made several years ago. The average age of U.S. VC-backed seed-stage startups increased 79 percent from 2009 to 2016, while the median pre-money valuation in 2016 dollars grew 74 percent. Over these same years, the average seed-round size tripled (see the data here). Today’s seed investments are what used to be Series A companies. And pre-seed firms have moved in to institutionalize the gap. These pre-seed deals are being done at the $2-5 million dollar range that used to be typical for all seed. Seed-stage definition creep, then, explains most of the change in valuations. Over these same years, the number of combined angel, pre-seed and seed deals climbed roughly sixfold. In the U.S., there were about 2,500 pre-Series A deals in the first three quarters of 2016. Resources for founders have exploded in the last decade. Normally this increase in deal volume would concern me — make me question whether there is irrational exuberance in the market. I know smart folks who have taken notice. But the relative stability in valuations indicates to me that the market is expanding in a way that is actually healthy. In other words, supply and demand have increased in tandem. While the market has become more robust and active, valuations have remained stable. There are many opportunities today for making great investments. That said, today’s seed investors need to be smart and careful. They need to be seeing and selecting the best companies, and they need to be paying appropriate valuations. Firms that fall short on either front will fail. So what is going on? How have supply and demand been expanding in roughly similar measure? Let’s look at each. Although generally new company formation is in decline, the reverse is true for the types of startups that seed investors back. Being a startup entrepreneur has become more attractive. More students are pursuing entrepreneurship than ever before — at Harvard Business School, 28 percent of recent graduates started companies within three years, more than four times the number at graduation three years earlier. I’m confident that the same is true of mid-career professionals leaving to start companies. There also is more support available to founders. Resources for founders have exploded in the last decade, with specialized knowledge easily available on almost any company-building topic. Accelerators and similar programs continue to grow, improve and proliferate, as do co-working spaces that are tailored to the needs of founders. Seed has not grown faster than the other venture stages. Open-source software, developer platforms and cloud servers continue to make it cheaper and easier than ever to launch a technology startup. And several credible “pre-seed” firms have emerged to support founders even earlier in the company-building life cycle. The specialization of investors at this earliest stage provides relevant support to the founders they work with. Finally, new hubs of startup activity continue to develop. It is easier than ever to seed financing in the “second cities” of innovation. I believe many of the most exciting opportunities are in these emerging hubs. Roughly half of my investments are outside of the Bay Area or New York City. The demand to invest at the seed stage has consistently grown. This will only increase in the long term as other sources of yield diminish. Limited partners (“LPs”) seek seed as a way to diversify their portfolio and earn higher returns. Seed investing brings high returns — both beta and alpha. Early-stage venture outperforms public equities over nearly every time horizon, and often dramatically. The 30-year return on early-stage venture beats the public indices by about 2.5x. The same is true for more recent measures, like three-year returns, as well. Seed stage is like traditional early-stage venture, with an even higher beta. The quality of seed-stage investors improves every year. Firms have proliferated, institutionalized and matured. New General Partners are bringing innovations and fresh perspective. The fittest will survive over time and these new firms will bring in 40-70 percent of the returns in the industry. 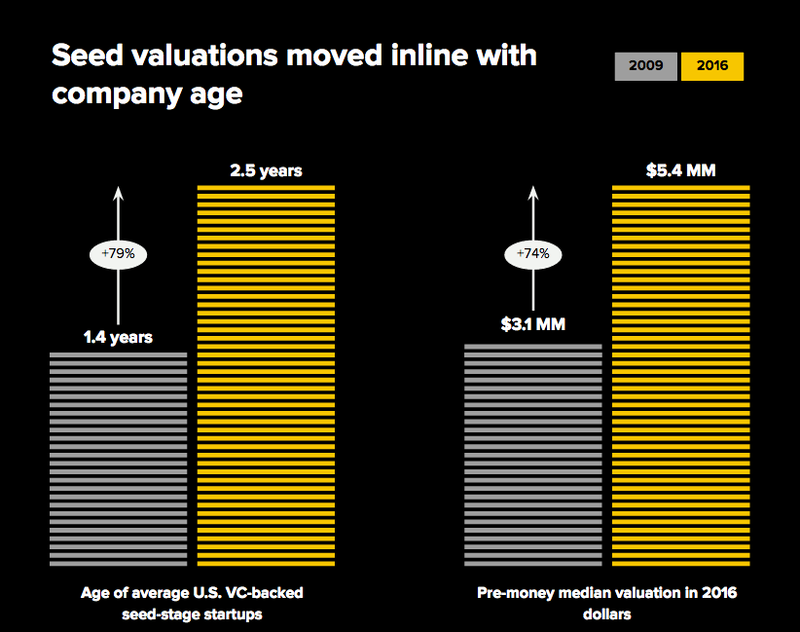 Here is another fact that may surprise you: Seed has not grown faster than the other venture stages. It has instead kept pace with venture growth overall. 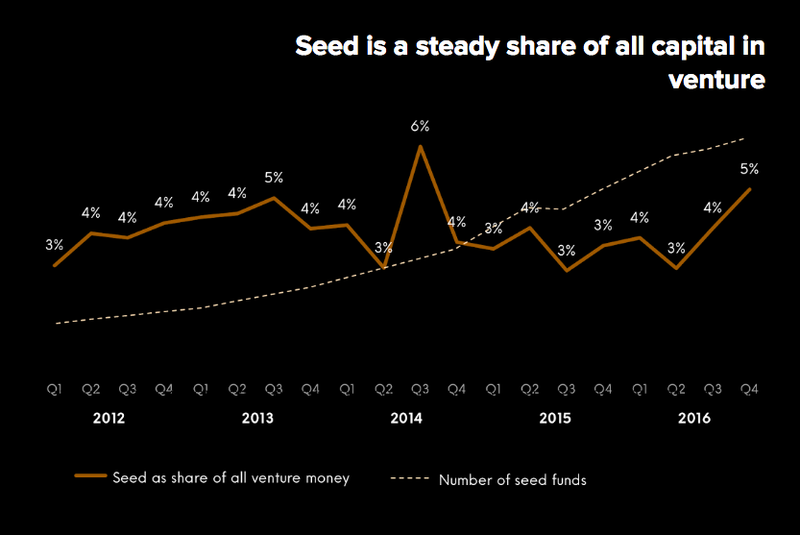 While the number of institutional seed investors has proliferated, the share of venture money that goes to seed has remained much steadier at an average of 3.9 percent quarterly over the last five years. The proliferation of firms is the natural path of growth at this stage of investing, when more dollars come into venture. This is different from later-stage investing, where individual firms expand assets under management when their industry grows. The long-term equilibrium of seed investing has many smaller firms. Successful seed funds limit their size and access relatively early. When more money comes into the space (in absolute dollar terms), it often comes into new funds. Firm proliferation is tricky for limited partners. Seed funds usually limit the size of their funds early to maintain strong performance. LPs that try to wait till the third or fourth fund to enter may find themselves challenged in the seed asset class. Data sources: Switch Ventures, First Republic Bank, PwC, PitchBook. * Thanks to PitchBook for digging in to get a new cut of the data for this analysis. Thanks to friends who provided comments, and Michelle Tandler, who especially laid it on.